This piece follows on from Alan Champney’s piece “How mathematics can fight the abuse of big data algorithms” in The Conversation. As correctly pointed out by Alan, a poor understanding or application of mathematics can have disastrous effects. Indeed, these exploitations may extend further than business and finance – often at the cost of those most vulnerable. Perhaps it’s time for us to stop trying to convince people that mathematics is important and instead begin by giving them reasons to arrive at that conclusion by themselves. As we settle into the new year and begin to look forward at the consequences of 2016 – most notably the UK’s decision to leave the European Union and the US appointing Trump as their 45th president- some, myself included, are not yet ready to stop looking for the reasons behind these choices. After all, if a majority public decide to actively disregard the opinions of trusted professionals and academics there must be something fundamentally flawed with the average individual’s approach to digesting facts and analysing statistics. With the recent announcement of a June 8th general election among high political tension, it is worth considering how these flaws in public knowledge arise, and what we can do to combat them. We’re taught the difference between ‘fact’ and ‘opinion’ at primary school with plenty of examples to help us distinguish between them. Facts are usually identified by their inclusion of numbers and observations whilst opinion doesn’t necessarily require any logical justification. This is where mathematics prevails and distinguishes between the truth and the false, between fact and opinion – but there is still plenty to be done. Specifically, it is how we interpret these distinctions and conclusions that shape our arguments and tailor our decision making. How mathematical reasoning manifests itself to us in addition to how we have been taught and trained to approach it will eventually determine our conclusions. Why is it then that maths and statistics are slowly seeing their authenticity questioned? Consider the Brexit campaign, filled with exhausted rhetoric around immigration and funding, with each side hurling around numbers and figures as if they were facts of undeniable validity that would obliterate opposing arguments. If this were true then political campaigning would be a matter of mathematical capabilities and data analysis techniques, opposed to policy and morals. The fact that we can manipulate statistics to serve our own good is testament to the power of mathematics, with the caveat of requiring some sort of understanding of their inner workings. “People in this country have had enough of experts,” claimed Michael Gove. I disagree – I think people are tired of experts they do not understand. 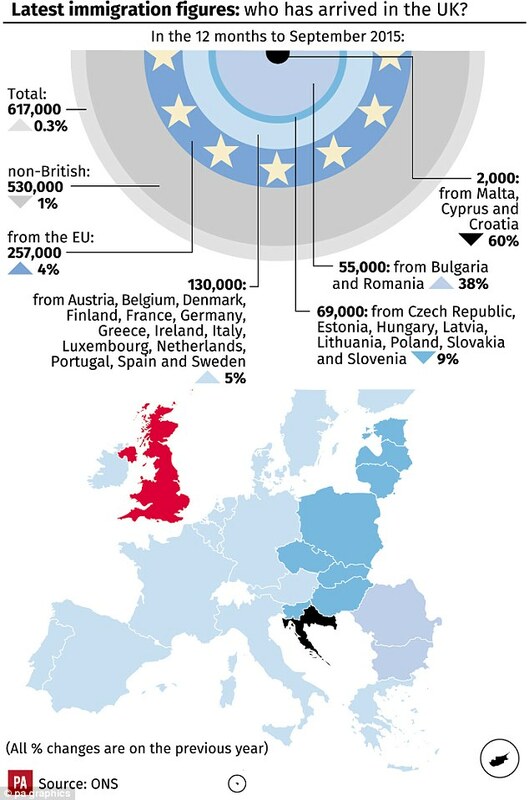 Figure taken from Daily Mail article “Tories will MISS their target of cutting net migration to under 100,000 by 2020, budget watchdog warns” – does the media aim to mislead with cherry-picked data and confusing presentation? For those who ended our relationship with maths at secondary school the mention of its name often brings back memories of frustration and panic. This has led to some calling for an end of its dominance all together (see Jenkins’ piece in the guardian) and demanding an evaluation of the mathematical curricula. Jenkins argues that calculus and number theory do not equip students with the correct tools and instead a more acute understanding of numeracy is all that’s needed to approach ‘risk’ and ‘proportion’. So, where do we draw the line between the necessary and the abstract? Or rather, how do we approach the task of selecting the most ‘useful’ parts of mathematics? In a world where complicated technologies punctuate our lives and shape our careers this is an especially difficult task, and the solution will often change in accordance with changes in lifestyle. The rise of cloud storage and machine learning in social media would not have been possible without breakthroughs in number theory and statistical evaluation. This disconnect between the mathematics that we’re taught at a compulsory level, and the mathematics that takes its form in reasoning and interpretation, is in large part the reason behind our vulnerability to the twisting of facts. From medicines that claim high efficiency in fat loss to the effects of immigration on a country’s economy, as well as debates around the ethics of the management of private data, we are all victim to exploitation when not properly taught fundamental tools in reasoning and decision making. Very frequently the electorate doesn’t understand the system that counts and assigns votes (Rolling Stone went as far as to call the US’s electoral college rigged), and fundamental concepts get cloaked in ambiguity- tax bracketing and interest rates being a regular topic of confusion. Last year, Chancellor George Osborne flirted with the idea of extending compulsory mathematical education until the age of 18. While this may be a step in the right direction I believe it ignores a fundamental flaw in mathematical education. It isn’t just what we are taught, it’s what we are told about what we’re taught. Granted it is no easy task to excite school students about p-values and all the possible forms of trigonometric functions, but pupils are not inspired if we don’t give them a justification for their studies. I’m in my final year of studying advanced maths courses and still find myself questioning the importance of certain areas. There is a vast void between theory and application, and between curriculum and implementation. Although this mixing of the pure and applied is inherent to and, arguably, the beauty of, mathematics, it complicates the matter for those in charge of deciding what to teach in the classroom. I believe this can be addressed by changing our approach to maths in schools: By lowering the focus on dry theorems and rules of geometry, and by constructing a fresh course in logical reasoning and the usefulness of mathematical tools. We should take some time to convince students of the need to learn mathematics by requiring them to consider the various conclusions that can be made from a single statistic. We could present case studies of news and ambiguous figures, and ask them to use logic and reasoning to decipher meaning. Whilst we shouldn’t grow complacent in teaching the requisites for advanced areas, we need to focus on inspiring them to look for significance in their education – a principle that should be adhered to in all educational situations. Mathematics, in its abstraction and convolution, lacks appeal when its role in everyday life is ignored. Subjects like languages and IT benefit from having evident applications and naturally intuitive uses, and unfortunately, quadratic equations tend not to. You can accept and reject opinion as you wish, but measured statistics and logical reasoning are independent to individual prejudice – a virtue intrinsic to mathematical thinking. We need to empower future generations with appreciation rather than frustration, and teach them how to dissect information. Then, perhaps, everyone can begin to trust experts.